Santa Grand Hotel Aljunied is located a 15-minute walk from Aljunied MRT subway station. Its rooms feature free Wi-Fi, flat-screen cable TVs and DVD players. The hotel offers a fitness center. Hotel Santa Grand is a 5-minute drive from Suntec Convention Center. A 20-minute drive brings guests to Changi International Airport. Modern rooms at Santa Grand feature private bathrooms with bathtubs and toiletries. Safes and ironing facilities are provided. A minibar is included in each room. Guests of the hotel enjoy free parking privileges. Its 24-hour front desk offers baggage storage services. A business center and laundry services are available. Guests have numerous dining choices in surrounding areas of the hotel. Alternatively, room service is available. 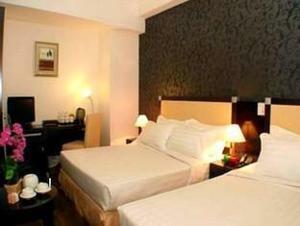 Rooms: Hotel Rooms: 42, Hotel Chain: Santa Grand Group. Free! One child under 12 years stays free of charge when using existing beds. There is no capacity for extra beds in the room.